Dharamshala is situated on the slop of Dhauladhar mountains; one of the famous peak of Kangra Valley. Dharamshala Hill Station gives you a chance to witness the Buddhist cultural heritage that is still thriving in the country. The place is dominated by the Tibetan people and is the refuge of Dalai Lama, the famous Tibetan leader. The Dharamshala Himachal Pradesh Tour arranged by us is accompanied by experienced guides who make your outings more informative and pleasurable. 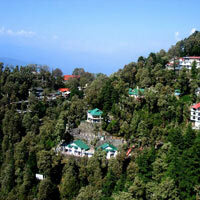 So just avail our Dharamshala Tour Packages and explore the mystic places of this spiritual city. Macleodganj is famous for the Tibetan settlement. The Dalai Lama resides in Macleodganj, which is now a major centre of Tibetan culture. It is full of bustling markets that sell carpets, handicrafts and delicious Tibetan food. The Beautiful temples in Masrur are carved out of monolithic rocks in the style of the Kailash Temple at Ellora. The ruined fort and Krishna temple at Nurpur are noted for fine wood carving. Nurpur, which was named after the Mughal Empress Nurjehan, is famous for its fine Pashmina shawls and textiles. (66 Km).